Paul, the groom, is brother of Kevin, who is a friend of mine for the last 15 years, and whose wedding I photographed quite a few years ago. Both Paul and his new wife Pamela hail from just outside Castleblaney, so it was there that my morning started – starting with the bride and bridesmaids, then popping over to the guys, and finally returning to the bride’s house for the last of the morning prep. Both houses are farm houses, and the bride’s house in particular, being busy with three bridesmaids all getting ready alongside the bride in one small room, posed a few logistical challenges, but rewarded with beautiful light. I was just back from a photography workshop in Manchester which focused on lighting, so this wedding was a great chance to put some new ideas into practice, and that was a nice creative challenge in itself. With the church a short drive out the road, things ran pretty well to schedule and Fr. Donnelly’s ceremony (he being a teacher of Pamela and the bridesmaids when they were at school) was perfectly pitched to the mood of the morning. 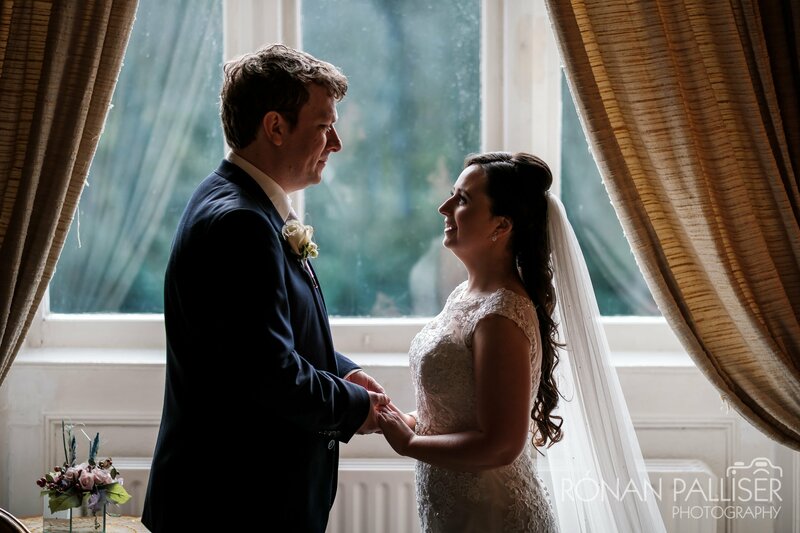 I was working alongside Tim, Gary and Rebecca of Red Apple Films​ for the day, and they were a delight to work with – they did an expert job of discreetly capturing the moving images of the day while I did my best to do the same with the still images. With a venue like Cabra Castle​ there’s no need for a stop off, so once we had family photos captured at the church after it had emptied, and kept all the nieces and nephews smiling, we headed straight for there. It was my first visit, but having photographed many times at two of its sister venues in Kerry and Louth I had high hopes, and wasn’t disappointed. The threat of rain kept our outside photoshoot brief, but we were able to get the inside outside under a canopy where, it turns out, it all began for Pamela and Paul at a wedding a few years ago, so it was nice to come full circle with a photo in the same seats! The speeches after the meal were just spot on in tone, duration and humour, right across the board, and got some great reactions from bridal party and guests alike. After a quick outdoor photo in the shelter of the castle door after dinner, it was time for the band to start, the dance shoes to be donned, the party to get going, and me to hit the road for Dublin, another enjoyable wedding captured for looking back on for, hopefully, many years to come.